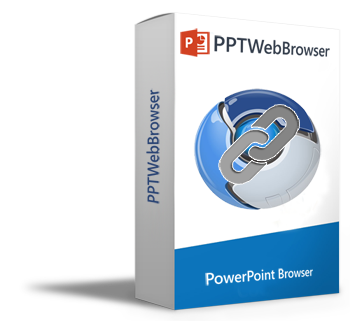 Load any web page or prezi inside PowerPoint seamlessly! Have you ever wanted to demo a website during a presentation? Now you can present any webpage during a live PowerPoint presentation and show the exact content you're talking about. Load any web page during a live PowerPoint Presentation! The controls are added to the Insert Tab in PowerPoint so you can easily add a web page onto any PowerPoint slide. Click on the slide you want to use as a web page and click 'Insert Web Page', then choose the URL for the page and that is it. When you play the presentation, that slide will instantly load a clean browser window with your web page full screen. When you exit the web page, your slideshow is exactly where you left it. Load any page automatically. Get the power of a web browser in PowerPoint. show content including Youtube videos, Vimeo videos, Prezi presentations, Flash movies, live reporting and more. Interactive & Non-Interactive modes! Interactive mode means you can click and type in the browser to navigate the web. Non-Interactive mode means any click on the keyboard or mouse will automatically close the browser and continue the PowerPoint presentation. This is very useful in situations where you need to show a web page but you only have a PowerPoint "clicker" to go forward and back. Built on Chromium architecture Web pages will display the same way they do in Google Chrome browser. The framework for PPTWebBrowser is the same as Google Chrome. Completely independant browser PPTWebBrowser is completely independant so it does not rely on existing browsers installed on the computer. Compatible with PowerPoint 2007 through PowerPoint 2016 on Windows Vista, 7, 8, & 10. Show an on-line Prezi presentation inside PowerPoint. Link to a Prezi presentation in your account to stream it live inside a PowerPoint presentation. Stream a video from any video site like Youtube or Vimeo. Link to a youtube or vimeo video to stream it inside a PowerPoint presentation. Show your live facebook page instead of just a screenshot. Demo a live website during a PowerPoint presentation. Load live quizzing or feedback from your website while the presentation is still going. Ever wanted to demo a live website during a presentation? Now you can! The web page will instantly load full screen and pause the presentation for you. When you close the browser, the presentation will continue, exactly where it left off. Presenting in Kiosk mode? No Problem with Non-Interactive Mode! Even if you only have buttons to go forward and backward in PowerPoint, you can load a full screen browser and keep control of it with Non-Interactive browser. When the browser launches your web page, it will automatically close itself the next time you press a button. This way, you can load web content to show off without giving away control of the presentation!